Discussion in 'Weapons' started by GeeDubayou, Jul 28, 2014. So this past week my parents took my daughter to New Brunswick to visit her great grandmother, while there, my parents went through my grandmother's attic and returned with a couple items of interest to me. The one I found most interesting was a bayonet which after I posted pictures of it onto the WWII living history association group I belong to's facebook page, I was told that the bayonet is a rare war dated K98 bayonet. Nice find! Not to rain on your parade, but I don't see what's so rare about it. ASW (E. & F. Horster & Co of Solingen) was a common manufacturer. In 1943 alone they produced something like 500,000 bayonets! The "44" is the year -- so the scabbard was made in 1944. WKC (Weyersberg, Kirchbaum & Co of Solingen) was also a common manufacturer. When it came out of the factory both the bayonet and scabbard would be matching, but its not rare to see mixed scabbards/bayonets. Does the bayonet have a serial number stamped on it? 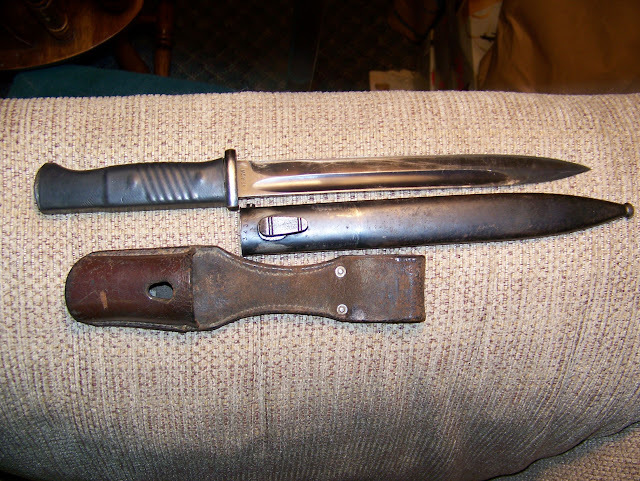 WKC made both commercial and "military" contract bayonets. From what I understand the commercial bayonets did not have a serial number. German bayonets are quite easy to find in Europe. They sell for 50-80 euros a piece (100-120 if there is a leather frog with them). If the scabbard and bayo have the same number it's a plus. Is the grip wood or bakelite (red or black)? Here in Canada I don't see much German stuff. If I do, it's usually repro. I'm certain it's wood. But it's a black color. I'm sorry I can't post pics at the moment but I'm trying to find a pic similar to it. I don't know where you are in Canada, but there's plenty of German stuff at the gun and militaria shows around here in Southern Ontario. Usually the prices are outrageous (150 bucks for a rough K98k bayonet, etc) so I stay away and focus on the guns! On the scabbard (metal), is a number 5797, under that is an "e" on the front of the scabbard is 44 asW, on the bayonet blade (black metal) is the letters W.K.C aside from that, there's not much else that signifies the bayonet and scabbard match. Mr Patton, I'm in Halifax, NS. Always nice to find no matter what! Here's one I found for $16.00 at a garage sale. Mismatched # with 42asw - 7721 blade & 3438 scabbard. Is there some sort of covering on the handle of the bayonet as the grip screws and rifle attachment mechanism are not immediately visible? Can you make out any Waffenamt stamps on the bayonet/ Scabbard? There should be one stamp on the 'ball' of the scabbard and two on the bayonet just above the mechanism that locks the bayonet to a rifle. I'll have to take a look when I get home. I scoured both bayonet and scabbard for other markings, but found nothing. I'll look harder later on and let you know. The stamps on the bayonet are often worn and hard to see but the one on the tip of the scabbard is usually in better shape. 16 bucks for one with a frog is dirt cheap Biak, good show. Yeah Skipper I got lucky They had $20 on it and I offered 16. Who knew? The handle has a soft pliable rubber cover that you can roll off. I've never seen any others with that on them ?? Howdy...I'm new on this forum but I just bought a WW2 vintage K98 bayonet. I was intrigued by your reference to a Waffenamt syamp on the ball of the scabbard. I magnified mine and it appears to have spread wings and WA under it. The rest of the inscription is damaged. Does this sound like I have a Waffenamp scabbard. Also imprinted on the scabbard is the full date 1939. The scabbard and bayonet have matching number 9940. It was manufacture Koppel1G.M.b.h. Very near forum. I will be checking in periodically. The Waffenamt stamp (a spread eagle with a number underneath it) was an acceptance mark used by the German military to indicate that the said piece of equipment was good for issue to the armed forces. The bonus with your bayonet and scabbard is that they have matching numbers. After capture, most of a German POWs personal equipment was thrown on to separate piles each of which could sometimes consist of thousands bayonets, scabbards, helmets etc, and that is why you don't often see matched numbers on bayonets and scabbards.